Poll: How often do you clean your motorhome? 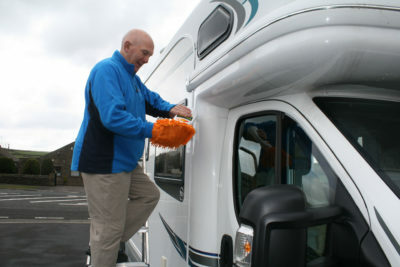 We’ve updated our guide on how to clean your motorhome for the Spring season ahead. So to keep the cleaning theme running we’d like to know how many times you give your pride and joy a good wash down, shampoo and polish throughout the year. The number of times you reach for the hot water, shampoo and wax will depend on how much you use your motorhome, as well as where it’s been stored over the winter months, and if it’s been kept under cover. Vote in our latest poll and tell us how often you clean your motorhome? To take part, pick a relevant figure or select “other” and add your comments in the box below. How often do you clean your motorhome? And if you want to tell us how often your think your motorhome should be cleaned during the camping season then leave a comment below too. We’ll report back the results at the end of March. I always wash our van after at least four hours of rain, and whilst it is still raining, as this helps to get rid of the dirt, and cut’s down washing the soap away. Clean and wax before put away for winter, then when every she is dirty – I like mine to be looking good as I do my car. Always clean inside after and during use on a trip – second nature – why wouldn’t you. Particularly as you are in such a confined space. I do a deep clean after a long trip and at the end for the season. Usually we clean ours the day after every trip and about once a fortnight if we have been away. A monthly wax polish. We leave all cupboard doors open when not in use to help with fresh air circulation . this saves a lot of accumulated dirt and muck leaching off the roof down the sides when the van is parked up. Depends on duration of trip & location. In the UK washed & waxed at least twice a year. Quick wash down of body & underside jet washed (carefully) after every trip in muddy / wintery conditions or when it’s dirty. Abroad (France, Spain & Portugal) a wipe down with a microfibre cloth occasionally (usually when it’s covered in morning dew) does the trick unless we’ve been in the mud. Interior thorough clean every 4-6 weeks and swept out every day (we don’t use our carpets). Trips are usually 2-4 days once or twice a month with 10-14 day trip in Summer although we have done a 10 month trip in Europe. Depends on what my wife has else to do after she has mixed the concrete. But generally, I get all the dirty jobs while she changes the sheets, usually after every trip. Cleaned after every use, and continually polished including roof, don’t understand people driving dirty vans. clean interior every trip and outside more or less the same except if the bodywork is still cleanish .Always before winter stand down with a tyre check . When the swifts nest for the summer, it can be up to twice daily! Once monthly throughout the other months though. Motorhome is cleaned after every extended use. It’s always at least washed off before returning to open storage with a more intensive clean if the weather has been bad whilst away and especially after winter trips to remove any salt residue. Spring and Autumn, and whenever it gets covered in mud or insects. I dont I have it valited, its much easier…….